Background: In 2007, the World Health Organization and the Joint United Nations Programme on HIV/AIDS endorsed voluntary medical male circumcision (VMMC) as an add-on HIV-prevention strategy. Similar to many other sub-Saharan countries, VMMC uptake in Botswana has been low; as of February 2016, only 42.7% of the program target had been achieved. Previous work has examined how individual-level factors, such as knowledge and attitudes, influence the update of VMMC. This paper examines how factors related to the health system can be leveraged to maximize uptake of circumcision services, with a focus on demand creation, access to services, and service delivery. 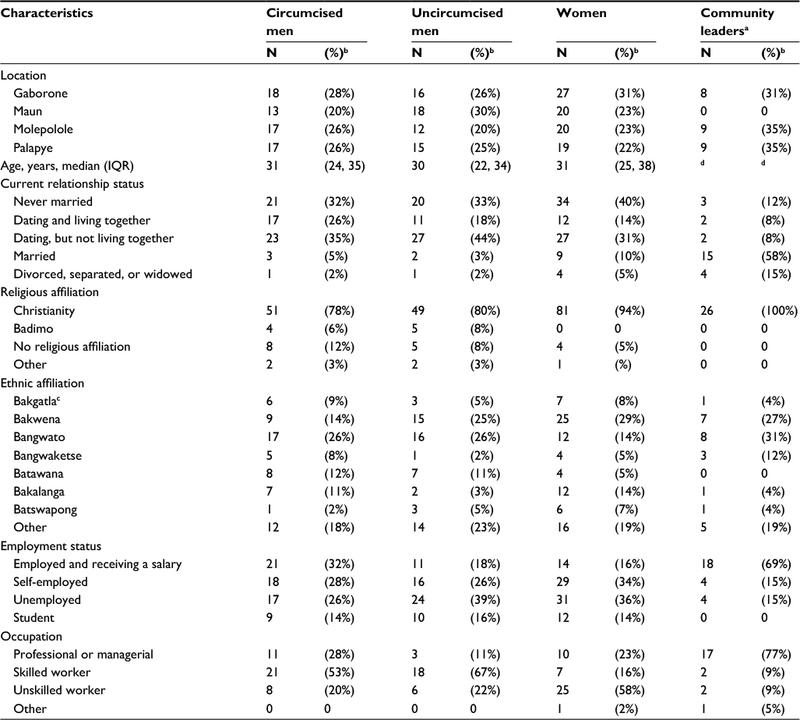 Methods: Twenty-seven focus group discussions with 238 participants were conducted in four communities in Botswana among men (stratified by circumcision status and age), women (stratified by age), and community leaders. A semi-structured guide was used by a trained same-gender interviewer to facilitate discussions, which were audio recorded, transcribed, translated to English, and analyzed using an inductive analytic approach. Results: Participants felt demand creation activities utilizing age- and gender-appropriate mobilizers and community leaders were more effective than mass media campaigns. Participants felt improved access to VMMC clinics would facilitate service uptake, as would designated men’s clinics with male-friendly providers for VMMC service delivery. Additionally, providing comprehensive pre-procedure counseling and education, outlining the benefits and disadvantages of the surgical procedure, and explaining the differences between the surgical and non-surgical procedures, were suggested by participants to increase understanding and uptake of VMMC. Conclusion: Cultural acceptability of circumcision services can be improved by engaging age- and gender-appropriate community mobilizers. Involving influential community leaders, providing a forum for men to discuss health issues, and bringing services closer to people can increase VMMC utilization. Service delivery can be improved by communicating the pros and cons of the procedure to the clients for informed decision-making. This substantial body of literature focuses on individual-level motivators and barriers for VMMC. However, little has been published about modifiable health system factors that affect uptake of VMMC. In fact, a recent review article calls for countries to critically examine these systems-level factors that influence circumcision rates.7 To our knowledge, only 1 study in Botswana has previously examined health systems factors related to uptake of VMMC; the study, which was designed to evaluate a specific 6-month communication strategy to increase community-level awareness of VMMC, identified long distances to treatment centers, long waiting periods, and shortage of staff and equipment as key infrastructural impediments.17 Further research, not limited to an evaluation of a specific intervention, is needed to identify the modifiable systems-level factors that influence uptake of VMMC generally. Therefore, we sought to identify potential changes within the health system that would maximize uptake of VMMC through improvements in demand creation, access to services, and/or service delivery. This study was conducted by the International Training and Education Center for Health (I-TECH) in Botswana, which is a collaboration between the University of Washington and University of California, San Francisco. The study received ethical approvals by the Health Research and Development Committee at the Botswana Ministry of Health and Wellness as well as the University of Washington Institutional Review Board. Focus group discussions (FGDs) were conducted in 4 communities in Botswana among men, women, and community leaders. These communities were purposefully selected to represent varying circumcision rates. Specifically, 2 of the communities (Gaborone and Palapye) represented high-volume VMMC clinics, which ranked in the top 25% of the total number of circumcisions performed nationwide. The remaining 2 communities (Maun and Molepolole) represented low-volume VMMC clinics, which ranked in the bottom 25% of the total number of circumcisions performed nationwide. Twenty-seven FGDs were conducted with 238 participants between July and November 2013. Participant characteristics are included in Table 1. Men and women aged 18–49 years were eligible to participate. An upper age limit was not applied to the community leaders. The age limit in this study coincides with that of the national VMMC program. Purposeful sampling of study participants was conducted according to age, and for men, circumcision status. As a result, FGDs were held with 2 age groups, 18–30 years and 31–49 years, of men (circumcised), men (uncircumcised), and women. Participants were recruited from places of public gathering (e.g. bus stations, shopping malls). Male circumcision status was assessed through self-report. The recruitment of community leaders was done through the government district bureaus and religious and education institutions. A letter describing the study and inviting leaders to participate was sent out to each of the bureaus and institutions in the 4 districts. Subsequently, follow-up calls or face-to-face meetings were held to confirm interest in participation and schedule the discussions. Focus group participants were provided with refreshments and travel costs. Notes: aA focus group discussion among community leaders in Maun was not conducted due to unresolvable scheduling constraints. bPercentages may not sum to 100% due to rounding. cTraditionally circumcising ethnic group. dData not collected. An inductive analytic approach was used to identify and describe the modifications than can be made in the health system to maximize VMMC uptake. Two investigators (KEW, JHL) identified concepts and key themes related to the topic and developed a coding scheme for major concepts. Using the coding scheme, 2 members of the research team (KEW, NR) independently coded a set of randomly selected transcripts to assess consistency between coders. Areas of inconsistency were discussed, noting why a particular code was assigned, and if appropriate, the operational definition was modified. The data set was coded using Atlas.ti v7.0 software (http://www.atlasti.com) by two authors (KEW and NR), discrepancies related to the assignment of codes were resolved by a third member of the research team (JHL). Thematic categories, which were used to form larger concepts, were derived from the coded data. Operational definitions were established for the thematic categories and examples of data for each of the thematic categories were assembled. I am in support of re-introduction of initiation schools, even though they cannot be the same as the old ones. I feel there should be a time when men meet to talk about and discuss issues affecting men. I feel they are not doing enough […] our leaders, especially traditional leaders are dragging their feet and though the government is playing its role, I still feel there is a gap that needs to be closed. A serious problem of knowledge and education inadequacy. I can’t remember at any time when a seminar, workshop, or anything of the like was held to sensitize men about any issues affecting them, let alone [VMMC]. They only hear about these things on the radio […] hearing from the radio is far different than hearing first hand, from an expert, sitting with them, face to face as that accords one the platform to ask for clarity. There is a billboard with a goalkeeper. It took me a while to get what it is all about. Every time I will pass by it I will see the goalkeeper and promise myself I will read it next time but I never get to read it. People are scared to travel long distances to be circumcised. Men keep wondering how they will cope [with] it for example, they take public transport, go circumcise and travel back in public transport. If you see a man going to the hospital, we call him a sissy because we believe that the hospital is for women. We need to instill into men that the hospital is for everybody. If we realize that the hospital is where we get treated and get better health, we can be able to utilize circumcision services. If the [VMMC] services were offered by male practitioners only, men would come in large numbers. It would work without women. Where there are women, men are reluctant to be engaged. They never ask whether you want to be circumcised by a woman or man, they will send you to the theater then you will see women coming there. Some of us are sensitive. It’s like you are being insulted or something because this woman may tell her friend that she has seen your manhood. A young, uncircumcised male in Maun unequivocally added that: “Being circumcised by a woman is not right.” Aside from gender, age was considered an important trait among providers. Older circumcision providers, regardless of gender, were preferred to young providers because they were perceived as being better at upholding confidentiality. I also feel that sometimes the people who are performing those surgeries are overwhelmed by their work such that the surgery room is not a friendly place, because you go there and sometimes you are met by someone who just wants to make sure the queue finishes such that even when they touch you it’s not in a loving way and I feel that the surgeons have a role in making men not go to circumcise in large numbers. It would be nice to find smiling people there not the ones who just want to remove your skin and let you go. [...] it’s like they are more concerned about advantages and try to hide disadvantages. They do not want people to know what complications of circumcision [exist], only advantages. I feel if this can be explained to people, they will be in a better position to choose what to do. [...] one of the things I have realized is that all the discussions about [VMMC] centers on its advantages, they hardly touch on the procedure itself […] whether it is painless or painful. I suggest that nothing be left out, let us be truthful when talking about VMMC. This study has highlighted areas of the health system that can be modified to maximize uptake of circumcision services. In relation to demand creation, participants felt that using age- and gender-appropriate mobilizers and community leaders was a more effective strategy than mass media campaigns. Participants felt that improved access to VMMC clinics would facilitate service uptake, as would designating men’s clinics for VMMC service delivery. Providing comprehensive pre-procedure counseling and education, outlining the benefits and disadvantages of the surgical procedure, and describing the differences between both the surgical and non-surgical procedures were suggested. These health systems modifications to demand creation, access to services, and service delivery hold promise for increasing uptake of VMMC. Similar findings have been reported in Botswana related to engaging age- and gender-appropriate community mobilizers.17 Additionally, studies have found that cultural acceptability can be improved through the involvement of community and political leaders.21,22 Influential leaders can play an important role in convincing men that medical circumcision does not conflict with culture. The role of community leaders and influential persons in sensitizing their communities in health care programs has been successfully executed in other resource-limited settings.23,24 Kenya, which has had a successful VMMC program, has benefited from the support of politicians. Several members of parliament and cabinet ministers publicly shared that they were circumcised in order to promote VMMC.24 In Malawi, leaders of traditionally non-circumcising communities were influential in creating demand for VMMC and encouraging males to undergo circumcision.23 Based on these findings, VMMC uptake in Botswana can be maximized by support from government and community leadership and using age- and gender-appropriate community mobilizers. Data from this study indicate that the effectiveness of media campaigns in creating demand varies and the type of campaign should be given ample consideration. Some participants questioned the effectiveness of these activities, highlighting the need to actively monitor efficacy as activities are initiated. There are multiple examples from the literature of highly successful VMMC campaigns. For example, a multimedia campaign in Uganda paired with community mobilization motivated 89% of exposed men to participate in at least 1 health promotion activity such as HIV testing as a result of the campaign, and over 10% of these men reported getting circumcised.25 In addition, a 30-day national mass-media campaign in Malawi was responsible for an increase in circumcision services.26 Botswana could apply some of the lessons learned from successful campaigns to develop a strategy to maximize VMMC impact. This study yielded important findings related to service delivery and the need for “men’s clinics” to support VMMC as well as general men’s health services. Poor health-seeking behavior by men has been well documented, particularly for preventative health services.27 Men have historically had lower HIV testing rates across sub-Saharan Africa; data from Botswana show they often comprise less than one-third of all testers.28,29 In the present study, there was recognition among participants that a discussion of men’s health issues was lacking. There is a clear need for future work to explore the challenges African men face in seeking health care services. A recent study from rural Zimbabwe on the role of masculinity in African men’s use of HIV services found that uptake of services was related to dominant masculinities, socio-cultural influences, and global expectations of HIV-infected patients.30 The present study, as well as 2 others in the region highlight that male health care providers were viewed as most desirable for delivery of VMMC services.31,32 Globally, patient preferences about their health care provider’s gender has been observed broadly in non-HIV-related fields, including urology, obstetrics and gynecology, and gastroenterology.33–35 This suggests male health care workers could be preferentially assigned to support these initiatives. This study also highlights the need for staff conducting VMMC counseling to have good knowledge about the pros and cons of the procedure and to ensure this information is communicated to the clients for informed decision-making. Future interventions could develop male-centered clinics, use male providers, and train health care staff to present the full range of information on circumcision to better address the needs of the population in this setting. While this article has important implications for work with men in Botswana and elsewhere, it has limitations. Findings from this study were from 4 of 28 districts of Botswana and may not be generalizable to the whole country. Additionally, circumcision status of male participants was assessed by self-report. Given that men may misreport their circumcision status,36,37 the ensuing discussion and corresponding findings could have been influenced by men assigned to an inappropriate focus group. Furthermore, among the circumcised men, reasons for undergoing circumcision were not assessed. Some participants may have been circumcised as infants or as a result of a medical complication (i.e., phimosis). These participants’ perceptions of systems-level factors about VMMC likely differ from those circumcised during the national VMMC campaign. Additionally, participants may have been inhibited to speak freely due to the traditional cultural and social norms related to discussing issues related to sexual health. Skilled, same gender moderators were used to mitigate this potential limitation. The uptake of VMMC programs is gradually improving in Botswana and in several priority countries in sub-Saharan Africa. This study has highlighted modifications related to the health system in the areas of demand creation and service delivery that can be employed to optimize VMMC uptake, including using age- and gender-appropriate mobilizers and community leaders for demand creation, improving access to VMMC services, particularly through men’s clinics, and providing comprehensive pre-procedure counseling and education that outline the benefits and disadvantages of the surgical and non-surgical procedures. The authors would like to gratefully acknowledge Boyce Otlhomile, Maggie Nkgau, and Spencer Manthe for their assistance in recruitment of study participants and transcription of audio recordings. This work was supported by the President’s Emergency Plan for AIDS Relief (PEPFAR), through funding to the University of Washington and I-TECH from the US Department of Health and Human Services, Health Resources and Services Administration (HRSA) Global HIV/AIDS Bureau under Cooperative Agreement number U91HA06801. WHO/UNAIDS. New Data on Male Circumcision and HIV Prevention: Policy and Programme Implications. Paper presented at: WHO/UNAIDS Technical Consultation on Male Circumcision and HIV Prevention: Research Implications for Policy and Programming; 2007; Montreux, France. Auvert B, Taljaard D, Lagarde E, Sobngwi-Tambekou J, Sitta R, Puren A. Randomized, controlled intervention trial of male circumcision for reduction of HIV infection risk: the ANRS 1265 Trial. PLoS Med. 2005;2(11):e298. Bailey RC, Moses S, Parker CB, et al. Male circumcision for HIV prevention in young men in Kisumu, Kenya: a randomised controlled trial. Lancet. 2007;369(9562):643–656. Gray RH, Kigozi G, Serwadda D, et al. Male circumcision for HIV prevention in men in Rakai, Uganda: a randomised trial. Lancet. 2007;369(9562):657–666. World Health Organization, UNAIDS. New Data on Male Circumcision and HIV Prevention: Policy and Programme Implications. Paper presented at: WHO/UNAIDS Technical Consultation on Male Circumcision and HIV Prevention: Research Implications for Policy and Programming; 2007; Montreux, France. UNAIDS. World AIDS day 2015 report: On the Fast-Track to end AIDS; 2015. Ledikwe JH, Nyanga RO, Hagon J, Grignon JS, Mpofu M, Semo BW. Scaling-up voluntary medical male circumcision - what have we learned? Hiv AIDS (Aucki). 2014;6:139–146. National AIDS Coordinating Agency. Progress Report on the National Response to the 2011 Declaration of Commitment on HIV and AIDS. Gaborone, Botswana; 2015. Centers for Disease Control and Prevention. Monitoring Selected National HIV Prevention and Care Objectives by Using HIV Surveillance Data: United States and 6 Dependent Areas, 2014. Atlanta, Georgia; 2016.
WHO. Guideline on When to Start Antiretroviral Therapy and on Pre-Exposure Prophylaxis for HIV. Geneva, Switzerland; 2015. Government of Botswana. Safe male circumcision additional strategy for HIV prevention: a national strategy. 2009. PEPFAR. PEPFAR 2016 Country Operational Plan Strategic Direction Summary; 2016. Hatzold K, Mavhu W, Jasi P, et al. Barriers and motivators to voluntary medical male circumcision uptake among different age groups of men in Zimbabwe: results from a mixed methods study. PLoS One. 2014;9(5): e85051. Herman-Roloff A, Bailey RC, Agot K. Factors associated with the early resumption of sexual activity following medical male circumcision in Nyanza province, Kenya. AIDS Behav. 2012;16(5):1173–1181. Ledikwe JH, Ramabu NM, Barnhart S, Ntsuape C, Semo BW, Wirth KE. Early resumption of sexual activity following voluntary medical male circumcision in Botswana: a qualitative study. PLoS One. In press 2017. Wirth KE, Semo BW, Ntsuape C, et al. Triggering the decision to undergo medical male circumcision: a qualitative study of adult men in Botswana. AIDS Care. 2016;28(8):1007–1012. Sabone M, Magowe M, Busang L, Moalosi J, Binagwa B, Mwambona J. Impediments for the uptake of the Botswana government’s male circumcision initiative for HIV prevention. ScientificWorldJournal. 2013; 2013:387508. Katisi M, Daniel M. Safe male circumcision in Botswana: tension between traditional practices and biomedical marketing. Glob Public Health. 2015;10(5–6):739–756. Evens E, Lanham M, Hart C, Loolpapit M, Oguma I, Obiero W. Identifying and addressing barriers to uptake of voluntary medical male circumcision in Nyanza, Kenya among men 18–35: a qualitative study. PLoS One. 2014;9(6):e98221. Harris PA, Taylor R, Thielke R, Payne J, Gonzalez N, Conde JG. Research electronic data capture (REDCap)–a metadata-driven methodology and workflow process for providing translational research informatics support. J Biomed Inform. 2009;42(2):377–381. Kaufman ZA, DeCelles J, Bhauti K, et al. A sport-based intervention to increase uptake of voluntary medical male circumcision among adolescent male students: results from the MCUTS 2 cluster-randomized trial in Bulawayo, Zimbabwe. J Acquir Immune Defic Syndr. 2016;72(Suppl 4): S292–S298. Djimeu EW, Brown AN. Strength of evidence on demand creation for voluntary medical male circumcision from 7 impact evaluations in Southern and Eastern Africa. J Acquir Immune Defic Syndr. 2016;72(Suppl 4):S321–S325. Sgaier SK, Baer J, Rutz DC, et al. Toward a systematic approach to generating demand for voluntary medical male circumcision: insights and results from field studies. Glob Health Sci Practice. 2015;3(2):209–229. Mwandi Z, Murphy A, Reed J, et al. Voluntary medical male circumcision: translating research into the rapid expansion of services in Kenya, 2008–2011. PLoS Med. 2011;8(11):e1001130. USAID. Uganda Joint Behaviour Change Communication Survey Report; 2013. CDC. Launch of VMMC Activities in Malawi Brings New Tool for HIV Prevention; 2014. Mills EJ, Beyrer C, Birungi J, Dybul MR. Engaging men in prevention and care for HIV/AIDS in Africa. PLoS Med. 2012;9(2):e1001167. Steen TW, Seipone K, Gomez Fde L, et al. Two and a half years of routine HIV testing in Botswana. J Acquir Immune Defic Syndr. 2007;44(4):484–488. Shand T, Thomson-de Boor H, van den Berg W, Peacock D, Pascoe L. The HIV Blind Spot: Men and HIV Testing, Treatment and Care in Sub-Saharan Africa. IDS Bulletin. 2014;45(1):53–60. Skovdal M, Campbell C, Madanhire C, Mupambireyi Z, Nyamukapa C, Gregson S. Masculinity as a barrier to men’s use of HIV services in Zimbabwe. Glob Health. 2011;7:13. Moyo S, Mhloyi M, Chevo T, Rusinga O. Men’s attitudes: a hindrance to the demand for voluntary medical male circumcision–a qualitative study in rural Mhondoro-Ngezi, Zimbabwe. Glob Public Health. 2015;10(5–6):708–720. Umar E, Mandalazi P, Jere D, Muula A. Should female health providers be involved in medical male circumcision? Narratives of newly circumcised men in Malawi. Malawi Med J. 2013;25(3):72–77. Consedine NS, Reddig MK, Ladwig I, Broadbent EA. Gender and ethnic differences in colorectal cancer screening embarrassment and physician gender preferences. Oncol Nurs Forum. 2011;38(6):E409–E417. Janssen SM, Lagro-Janssen AL. Physician’s gender, communication style, patient preferences and patient satisfaction in gynecology and obstetrics: a systematic review. Patient Educ Couns. 2012;89(2):221–226. Kim SO, Kang TW, Kwon D. Gender preferences for urologists: women prefer female urologists. Urol J. 2017;14(2):3018–3022. Lissouba P, Taljaard D, Rech D, et al. Adult male circumcision as an intervention against HIV: an operational study of uptake in a South African community (ANRS 12126). BMC Infect Dis. 2011;11:253. Thomas AG, Tran BR, Cranston M, Brown MC, Kumar R, Tlelai M. Voluntary medical male circumcision: a cross-sectional study comparing circumcision self-report and physical examination findings in Lesotho. PLoS One. 2011;6(11):e27561.